In dramatic testimony Monday, Obama holdover Attorney General Sally Yates testified that she warned the incoming White House its newly installed national security adviser, Michael Flynn, was “compromised” by a lie and therefore a potential “blackmail target” of the Russians. President Trump can be forgiven for ignoring her warning. It was Yates who was blackmailing him. It’s clear from recent revelations that President Obama and his holdovers had a morbid fear of Lt. Gen. Flynn, an anti-Islamic terror hawk, and were gunning for him early in the transition, long before rumors he was involved in any alleged Russian conspiracy. Then in late December or early January, someone working under Obama’s own national security adviser, Susan Rice, unmasked routine NSA intercepts of the Russian ambassador. Was it to spy on Flynn, Rice’s replacement? Just days after the inauguration, moreover, Yates used those same NSA transcripts to try to get Flynn fired, by warning the White House that he was “vulnerable” to Russian extortion. Despite her warnings, Flynn remained in his position for 18 more days (a gap Democrats say is as scandalous as “the 18-minute gap in the Nixon tapes”). He was only forced to resign after somebody from the Obama administration illegally leaked the intercepts to The Washington Post and created a political embarrassment for President Trump. Unlike the Obama officials who disclosed highly classified information, Flynn committed no crime. Though he misinformed Vice President Mike Pence about the nature of his conversation with the Russian ambassador (the two did, in fact, discuss the sanctions Obama belatedly and conveniently slapped on Russia after the election), he did not make false statements to the FBI. And Flynn made no promises that the sanctions would be removed. The FBI declined to press charges. Yates knew what the FBI knew when she raced over to the White House on Jan. 26 to warn Trump’s general counsel that Flynn was “compromised.” She also knew that the Obama administration had just weeks earlier renewed Flynn’s national security clearance at the highest levels. And that the intelligence community had “no evidence,” as Obama’s intelligence czar just reconfirmed, that Flynn “colluded” with Moscow. Still, Yates insisted Flynn posed a threat to the government. Why? Because, she said, he failed to truthfully brief the vice president. The implication was that unless Trump fired Flynn, he’d pay a price. So it was Yates, in a sense, who was blackmailing Trump. “Why does it matter to the Justice Department if one White House official lies to another White House official?” White House Counsel Don McGahn reasonably asked Yates, when she rushed into his office with her hair on fire. She explained that by lying to Pence, Flynn could be exposed to the Russians at any time and that might open him up to blackmail. The Kremlin, she added, likely had its own proof he lied to the vice president and could use it to maintain “leverage” over foreign-policy decisions as long as he remained in office. That makes no sense: Any “leverage” the Russians may have had over Flynn vanished the moment Yates informed the White House he lied. The only way he was vulnerable to blackmail at that point was if McGahn kept Flynn in the dark about what had been revealed to him and other White House officials. But McGahn, White House spokesman Sean Spicer and other top officials no doubt huddled with Flynn to get his side of the story as soon as Yates left. So any threat of extortion left with her. No wonder the White House didn’t act on her warning. Trump insiders also considered the source. Yates is an Obama loyalist with a liberal agenda. 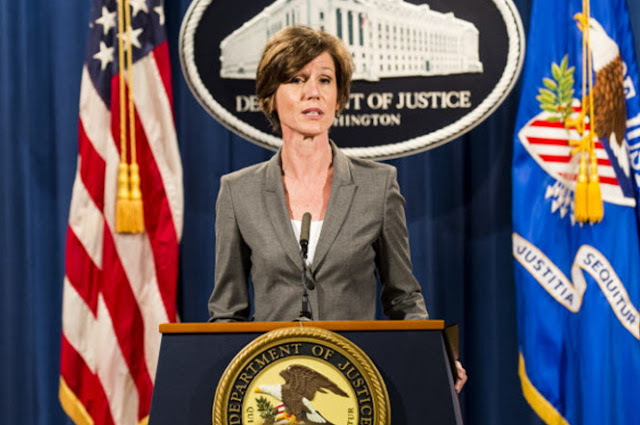 Though the media portray Yates as a heroic whistleblower, who was a “career prosecutor” before Obama appointed her, she was hardly apolitical or impartial. In fact, she is a partisan Democrat who comes from a long line of Democrats. Her father and great grandfather were both Democratic judges. Her great uncle was a former Democratic US senator and governor of Georgia. Her husband twice ran for Congress as a Democrat. And Federal Election Commisson records show her family has given tens of thousands of dollars to Hillary Clinton, Obama and the DNC. What’s more, the Democratic Party reportedly is drafting Yates, who recently appeared at the Carter Center in Atlanta with former Attorney General Eric Holder, to run for governor of Georgia. But her partisan colors were really exposed on Jan. 30, when she refused to enforce Trump’s temporary ban on immigrants from terror hotspots. In doing so, she overruled her own office of legal counsel, which concluded the executive order was lawfully and properly written. Yates may have hoped to maneuver Trump into firing Flynn. But in the end, she was the one Trump fired. Make no mistake: Yates was no Paul Revere saving the nation from Russian moles. She was a partisan hack trying to save Obama’s liberal legacy.